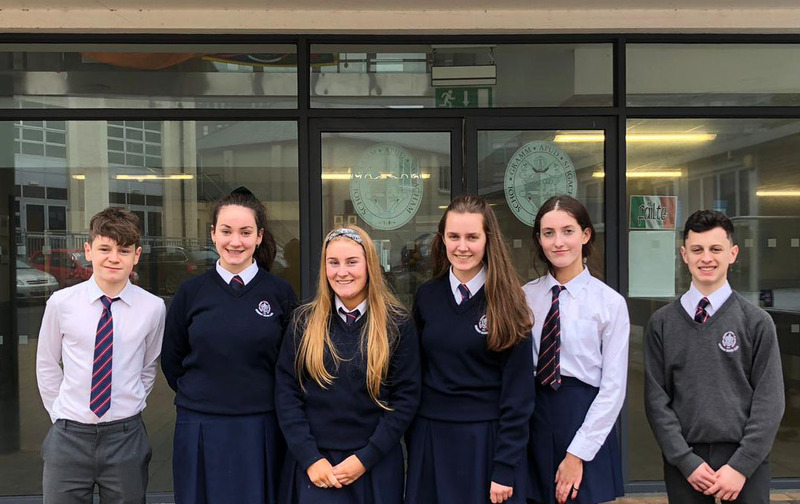 Transition Year students Chloe Lougheed, Emma Gallagher, Avril Murray, Mark Mulhern, Emma O’Gorman and Luke Glennon recently competed in the AIB Build-A-Bank Challenge, resulting in them participating in the National Final in the RDS on March 13th. The AIB Build-A-Bank Challenge sees a team of six selected students setting up and managing a bank in their schools. The students get involved in everything from developing a business plan, branding their school bank and engaging with their community and customers through creative marketing campaigns. The bank was called the “BFG Bank”, and the team selected the Paediatric Unit in Sligo University Hospital as the focus of their community involvement, raising funds to help provide beds for parents to sleep on when staying overnight with their children. To raise funds for this very worthy cause the team hosted a variety concert in the old gym on the 11th of February. The concert was a huge success, consisting of a variety of acts from 1st to 5th year, including teachers and even one of the bank members. The raffle prizes were sponsored by many local businesses and the committee was very grateful for their support. The six students also organised a bake sale at break-time in the foyer, and a coffee morning in the local AIB branch, where they informed customers of their participation in the competition and the Paediatric Unit’s current situation. The team also made their way over to the Paediatric Unit to read storybooks and play games with the children. This was an enjoyable experience for all. Finally, on the 13th of March, the six students made their way to the RDS for the national final. There they presented their project, to the judges and teams from all around the country. In total, the BFG Bank raised over €1000 for the Paediatric Unit and the students would like to thank all the teachers that supported them throughout the competition.